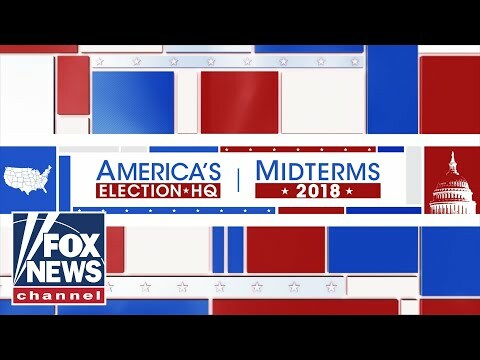 WATCH LIVE: As midterm election races are called tonight, check back here to see the live results of all the congressional and gubernatorial races around the country. 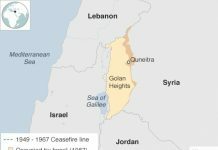 See updates below videos. A majority of voters today do not think President Donald Trump should be impeached, according to NBC News Exit Poll results. Fifty-four percent of voters say Congress should not impeach Trump, while 41 percent say Congress should do so. But the idea of impeaching Trump finds strong support among Democrats. 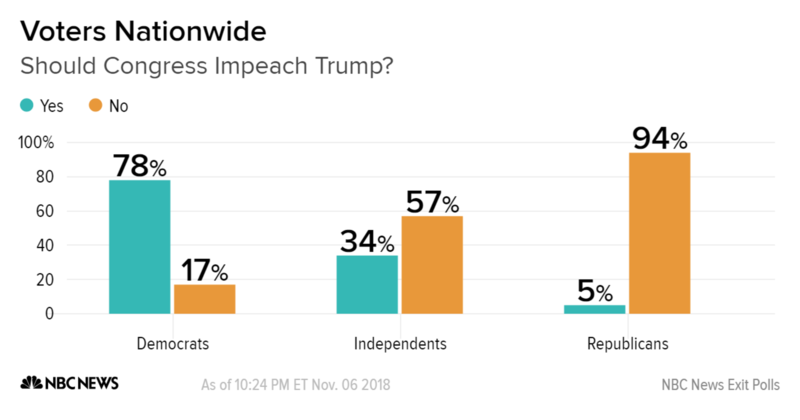 Among voters in today’s midterm elections, about eight in 10 Democrats say that Trump should be impeached and removed from office. A majority of independent voters are opposed to impeachment; not surprisingly, so are almost all Republicans. NBC News projects that the Democratic Party will take control of the House of Representatives. A party needs to control 218 seats in the House for a majority. Some of the key House races that allowed NBC News to call Democratic control of the House included MN-3, CO-6, FL-27, NY-11, VA-2, TX-32, MI-11. Republicans will hold the Senate after Sen. Ted Cruz, R-Texas, defeated Democratic challenger Beto O’Rouke, NBC News projects — setting up a Congress divided. Republican Roger Wicker has won re-election to the Senate in Mississippi, NBC News projects. With 40 percent of the vote in the solidly red state tallied, Wicker had 59 percent and Democrat David Baria had 38.9 percent. Wicker had been expected to easily win Tuesday night. Democratic State Sen. Laura Kelly has won the Kansas gubernatorial race against Republican Secretary of State Kris Kobach, NBC News projects. Kelly defeated Kobach and independent Greg Orman on Tuesday in a race that was considered a toss-up by election watchers. Kobach had defeated Gov. Jeff Colyer in the Republican primary and had President Donald Trump’s endorsement. He was perhaps best known nationally for being the vice chairman of the Trump administration’s election-fraud commission. Republican Rep. Kevin Cramer has defeated Democratic Sen. Heidi Heitkamp in the North Dakota Senate race, NBC News projects. With 25 percent of the vote in the state tallied, Cramer, who serves as North Dakota’s sole member of Congress, was beating Heitkamp 57.9 percent to 42.1 percent. Cramer’s win — which picks off a seat from the Democrats — boosts the GOP’s chance of keeping control of the U.S. Senate. Earlier this fall, Cramer and Heitkamp had been running a close race, but in recent weeks Cramer opened up a comfortable lead in the polls over his one-term opponent. Despite months of being bombarded with political ads, phone calls and texts — and a constant drumbeat of political news coverage on television and social media — one out of six U.S. voters managed to hold off until this week to decide on their vote for Congress, according to results from the NBC News Exit Poll. Who waits this long? 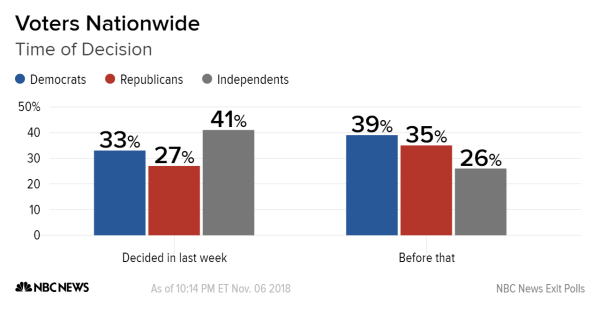 Late-deciding voters were particularly concentrated among those who don’t identify with the two major parties — they made up roughly four in ten of the voters who decided in the past week. By contrast, Democrats and Republicans were sure of their vote earlier, making up about three-quarters of those deciding on their vote for the House before the last week of the campaign. Republicans maintained control of the Senate Tuesday as Sen. Ted Cruz won reelection against Democratic challenger Beto O’Rourke in the highly watched race, NBC News projects. With 79 percent of the vote tallied, Cruz was leading O’Rourke 51 percent to 48.4 percent. NBC News projects that Democrat Sharice Davids will defeat Republican Kevin Yoder in Kansas’ Third Congressional District, a crucial pickup for House Democrats’ plan to regain control. With her victory, Davids becomes the first openly LGBTQ person elected to Congress in Kansas, and the first Native American woman to be elected to Congress. Massachusetts voters have elected the first African-American woman to a U.S. House seat. Ayanna Pressley, who was also the first black woman elected to the Boston City Council, was elected to the 7th Congressional District in Massachusetts. Pressley did not have Republican challenger. She defeated Democratic Rep. Mike Capuano, a 10-term incumbent, in a high-profile Democratic primary in September. NBC News projects that Phil Scott, the Republican governor of Vermont, has been elected to a second term. Scott defeated Democrat Christine Hallquist, a former electricity executive. Hallquist’s bid attracted national attention because of her status as the first transgender woman to be nominated for governor by a major party. Scott is popular in the Green Mountain State, where voters in this election split their ballots and re-elected independent Sen. Bernie Sanders and Democratic Rep. Peter Welch, according to NBC News projections. Veterans of America’s armed services have registered relatively strong support for Republican candidates in the 2018 midterm elections, according to the NBC News Exit Poll. 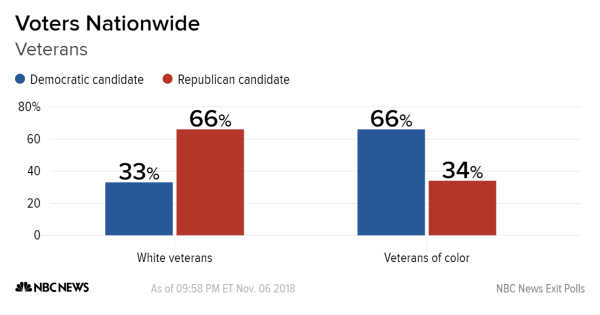 More than half of all veterans voted for the GOP candidate in their House districts, compared to just four in 10 voters who are not veterans. Veterans made up 13 percent of those casting ballots in 2018. Today’s results are consistent with the 2016 presidential race, when 60 percent of veterans voted for Republican Donald Trump. But there is a clear divide between white veterans and veterans of color. While about two-thirds of white veterans voted for the Republican ticket for House, nearly the exact opposite is true for veterans of color: About two-thirds of these veterans supported the Democratic candidate. Mitt Romney has won the U.S. Senate race in Utah, NBC News projects. Romney, the Republican presidential nominee in 2012 and the former governor of Massachusetts, defeated Democrat Jenny Wilson in the race, NBC News projected. He will replace GOP Sen. Orrin Hatch, who announced earlier this year that he will not seek election to an eighth term. Romney, who grew up in Michigan, has a home in Utah and deep ties to the state, including through his Mormon faith. He was credited with rescuing the troubled 2002 Winter Olympics in Salt Lake City, and he has a network of well-placed political supporters in the state. Romney’s projected win marks a triumphant return to public office for the 71-year-old Republican dignitary. The former presidential nominee, an outspoken critic of President Donald Trump, could become a powerful foe of the White House in the Senate GOP caucus. However, a Romney confidante told NBC News earlier this year it was unlikely he would take that approach. California spending for the 2018 election cycle, which includes congressional midterms, a gubernatorial race and a number of statewide initiatives, has exceeded $1 billion, campaign data publication California Target Book estimates. 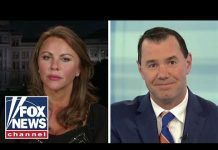 The spending includes more than $287 million on congressional candidates and nearly $20 million alone on a U.S. Senate race between two Democrats, according to Target Book’s estimates. That figure was outdone by more than $366 million spent on statewide initiatives, which included a proposal to allow cities to expand rent control and another that would repeal a 12 cents per-gallon gas tax. Spending on campaigning for top statewide offices, including governor, exceeded $222 million, the Target Book report found. Expenditures for state legislative seats surpassed $156 million. “The tremendous interest in the election is reflected in the money and in the turnout,” he said. Incumbent Democratic Sen. Joe Donnelly issued a statement after conceding to GOP challenger Mike Braun in the Indiana Senate race. The closely watched Texas Senate race between incumbent Republican Sen. Ted Cruz and Democratic challenger Beto O’Rourke is too early to call, according to NBC News. With 73 percent of the vote in the Lone Star State tallied, Cruz was up over O’Rourke, a congressman representing an El Paso-area district, 49.8 percent to 49.6 percent. O’Rourke, who had raised record-shattering amounts of cash during his race, and Cruz had been running neck and neck in recent polls. Should the Democratic Party capture the House of Representatives in today’s midterm elections, they’ll have independent voters to thank, according to results from the NBC News Exit Poll. 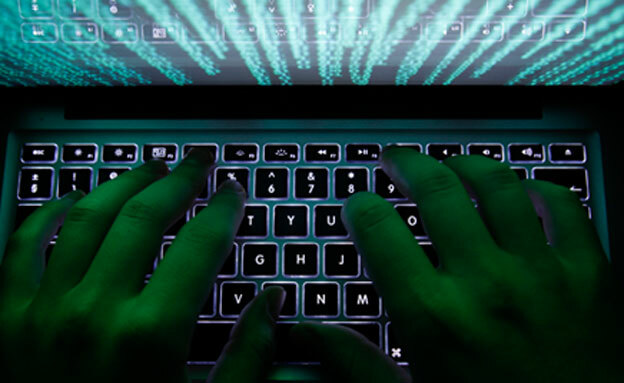 By more than a 10-point margin, voters who reject party labels and describe themselves as either independent or “something else” reported casting their votes for House Democrats over Republicans. Independent voters made up three in 10 voters casting ballots in today’s midterm elections. The shift represents a substantial swing to the Democrats compared to the recent past: Exit polls from previous years show that independent voters have supported GOP presidential and Congressional candidates in every national election since 2010. 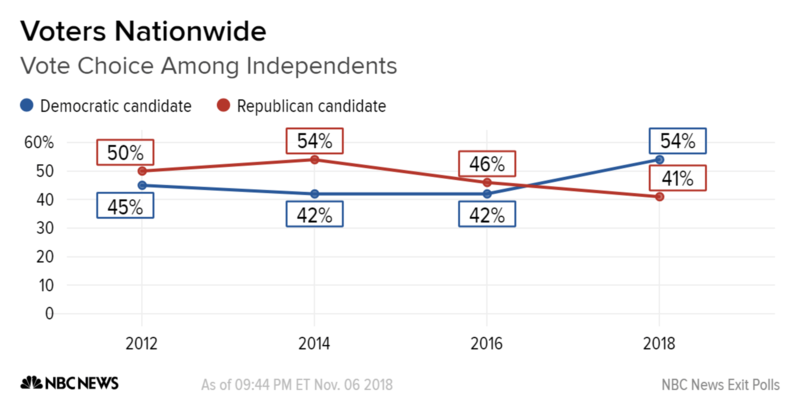 The last time Democrats won the support of independents at the national level was when the party’s ticket was first headlined by Barack Obama, who captured a majority of the group’s vote in his successful first bid for the presidency in 2008. Rashida Tlaib won Michigan’s 13th Congressional District on Tuesday, NBC News projects, becoming the first Palestinian-American woman elected to Congress. Tlaib was previously elected to the Michigan House of Representatives. Read more about Tlaib on NBC News.